The three extant species of the Anhimidae are endemic to South America and most conspicuously differ from other anseriform birds in bill morphology, the absence of webbed feet, and the highly pneumatized skeleton. The only published Paleogene remains of this group of birds were described by Alvarenga (1999) from the late Oligocene/early Miocene of the Taubate Basin in Brazil. The description of Chaunoides antiquus Alvarenga, 1999 was based on several isolated postcranial bones. C. antiquus was smaller than the smallest extant species of screamers, the Northern Screamer Chauna chavaria, and had a less pneumatized skeleton. 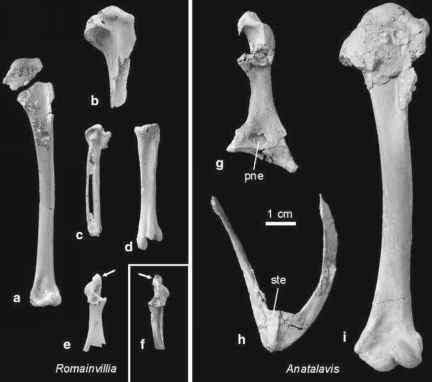 According to Alvarenga (1999), Loxornis clivus Ameghino, 1895 from the late Oligocene (Deseadan) of Argentina, which is based on a distal tibiotarsus, may also be a representative of the Anhimidae. Ericson (1997), Olson (1999b), and Feduccia (1999) mentioned unpublished remains of early Eocene anhimid-like birds from the Willwood Formation (Wyoming) which are under study by Peter Houde. A similar species also occurred in the early Eocene London Clay of Walton-on-the-Naze (see Table 4.1 in Feduccia 1999; own observation).